Need more usable desktop space? Want to improve typing comfort? Our Stand Steady 20" Retractable Clamp-On Keyboard Tray / Under Desk Keyboard Tray is calling your name. 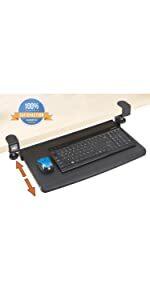 This smooth-gliding, retractable keyboard holder provides a stable platform to place your keyboard and mouse beneath the desktop. When you need to type, the keyboard is set at a more ergonomic height while a beveled front edge further enhances typing comfort. When you need to write some notes or make a call, slide the keyboard drawer under the desk and out of the way. 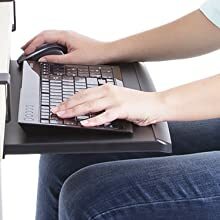 This ergonomic keyboard tray will easily attach to your desk in seconds. 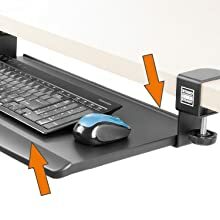 And due to the easy thumb screw clamp-on mechanism with padding, your desk is protected! Best of all, no drills, screws, or permanent modifications are needed. The 20 inch width of the keyboard platform will accommodate practically any keyboard while still leaving room for your mouse or other accessories. 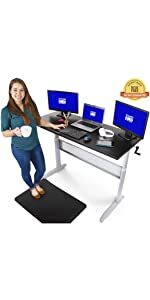 Fits most desks that are wider than 26 inches and have a thickness of 1.5 inches or less. 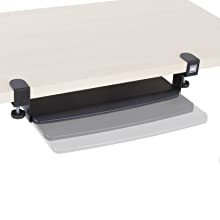 BY POPULAR DEMAND: We got tons of requests for a clamp on keyboard tray that fits smaller desks or leaves room for accessories like our Desk Potato. The 20 inch surface is plenty wide for your full-sized keyboard and mouse, but fits under even more desks than our previous model. 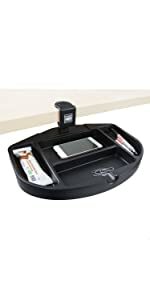 If you have limited under-desk space, this is the one you want! 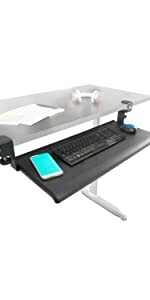 OPTIMUM TYPING: This ergonomic keyboard tray places your keyboard 4.75 inches below the desk top, so your arms, wrists, and hands are positioned to reduce fatigue and pain over a long workday. The beveled front edge further improves typing comfort. EASY ASSEMBLY: The keyboard holder installs with no tools! No need to drill holes in your existing desk or risk damage! 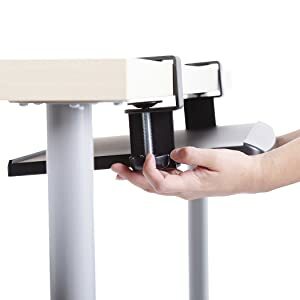 Your new keyboard shelf will clamp on in seconds with sturdy thumb screws. The clamps are padded to protect your desk’s finish. SMOOTH GLIDING: When you’re done typing, the retractable adjustable keyboard tray simply slides under your desk and out of the way! 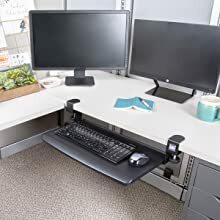 FITS MOST DESKS: The Stand Steady Clamp On Keyboard Tray will install on practically any desk that is wider than 26 inches and has a thickness of 1.5 inches or less. Fully expand and retract your Keyboard Tray with ease! With the easy glide tracks, you can effortless slide you tray in or out. Slide your tray in to give you more space to dance it out to your favorite song then slide it back out to quickly get back to work when your boss walks by, they'll never even know. Our customers requested it, and finally the moment you've been waiting for (us too) here it is! The compact clamp on keyboard tray! Designed specifically to fit into your workspace. This 20" Keyboard Tray is the perfect desk accessory for your home & office -- even your cubicle! Who said desks edges need to be square...we didn't! The innovative beveled edge allows you to comfortably rest your wrist. The ergonomically designed Stand Steady Keyboard Tray has rounded wrist support to relieve pressure and encourage a neutral wrist position while typing. Uniquely designed with a raised ledge along the front and back, preventing your keyboard and any accessories...like your mouse, or that all gold pen that your boss gave you that one time which was odd but now you're very attached to it...from sliding off your tray. Don't worry we got you, and your stuff! QUICK & EASY CLAMP ON! INSTALLATION JUST GOT A WHOLE LOT EASIER!! Unlike most keyboard trays, this Keyboard Tray simply CLAMPS onto nearly any surface! Tranzendesk 55" Standing Desk - Fits Perfect with your Keyboard Tray! 11.75" x 20" 12" x 27" 12.5" x 6.5" 55" x 12" 57" x 27.8"
This was the perfect solution! I have a desk that is too high for comfortable typing, but also not wide enough to accommodate most clamp-on keyboard trays (mounting was not an option). This smaller keyboard tray was the perfect size, was SO easy to attach, and works perfectly. I couldn't be happier, and would definitely purchase it again.